These Safety Can Compatibility Guides for Justrite and Eagle Galvanized Steel, Stainless Steel and Polyethylene Safety Cans are for reference only. They is not a substitute for the user clearly understanding the nature and proper use of the chemicals being used, area hygiene and environmental conditions, and the laws governing use. Check with the chemical manufacturer for more information. Mixing of different chemicals and chemical concentrations may impact suitability and compatibility. This chart is not a guarantee, express or implied, of fitness of use and CP Lab Safety, Justrite and Eagle assume no responsibility for the use or misuse of this information. The table above was provided by Justrite Manufacturing for their safety cans. The table below was provided by Eagle Manufacturing for their safety cans. Galvanized Steel/Terne Plate: when chemical purity is not critical. Some chemicals may adversely affect paint. Polyethylene for storing acids, caustics and other corrosive chemicals. 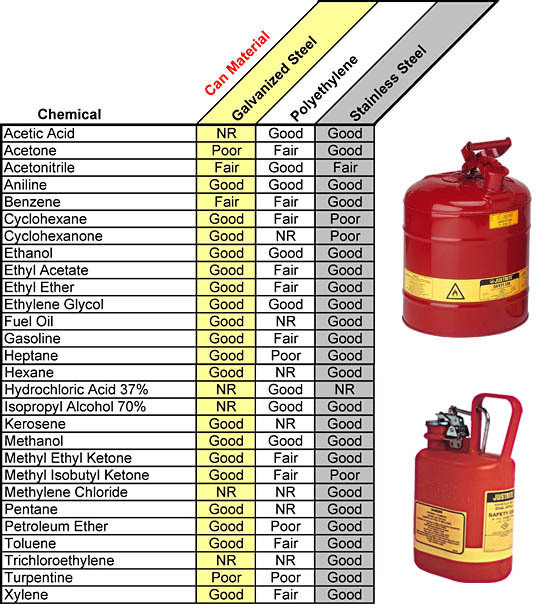 Stainless Steel: when chemical purity is critical. CAUTION: Resistance to mixed solvents is unpredictable. This Guide DOES NOT apply to mixtures, even if the can is compatible with all components of the mixture.